What do you feel when someone suggests you for a whole body master Health Check-up? Several things come into our minds, “Do I look sick? Do we really need a whole body check-up? What is it exactly? Why has the doctor asked me to get this test done?” Calm!! It is just a test. You need not be sick or suffering from some disease to undergo any Master Health Check. It is always good to be informed about how your body is functioning and what you need to do to keep yourself healthy. 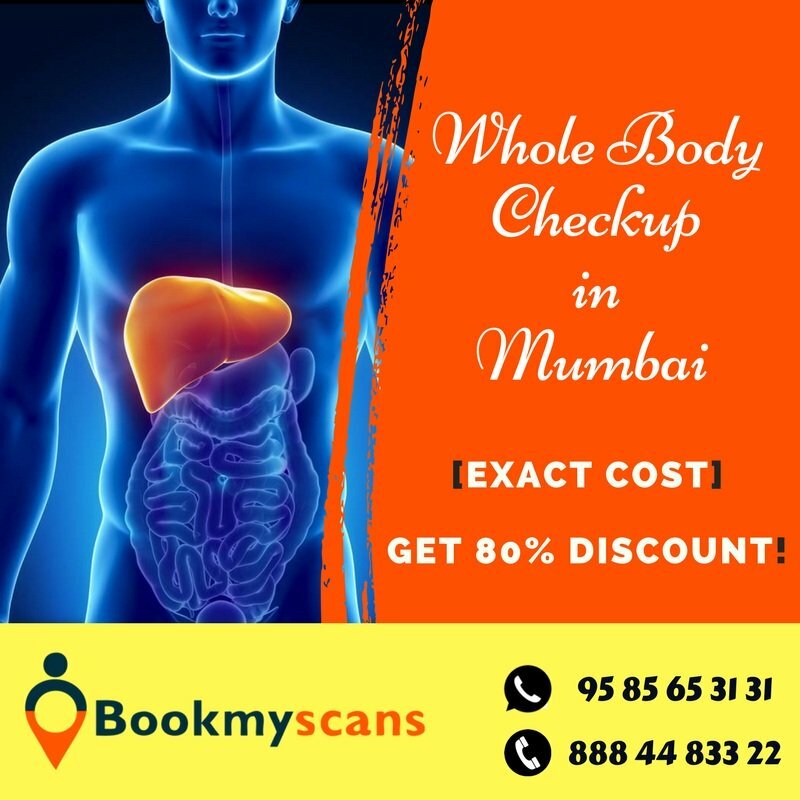 Whole Body Checkup in Mumbai [Exact Cost] – Get 80% Discount! India, with its developing cities and with the uncontrolled urbanization and modernization, the present-day lifestyle comes with its own set of challenges. “The grass is always greener at the other side”, people always think a metro life is so fascinating and people living there have a better life. But that’s not really true. The life in a metropolitan is not as pleasant as it seems to be. With all the fashionable spending and living, anxiety and stress come complimentary. 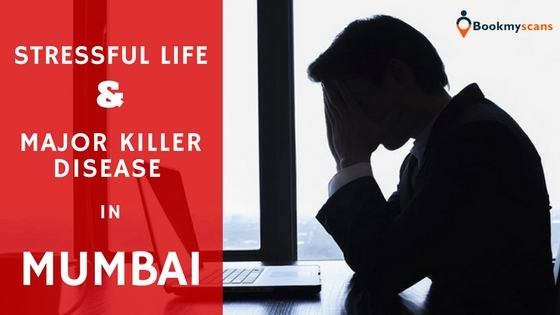 “Stress” defines “N” number of problems people face in Mumbai and cannot be defined with a rigid definition. The amount of stress varies from person to person and is affected by the innumerable circumstances. Factors differ, for example the environment in which a person lives also plays an important role that affect the physical and psychological health of an individual. Balancing professional commitments, managing social life, basically the work-life balance, housewives trying to cope with the limited monetary deadlines, working mothers trying to maintain the time divided between family and work, senior citizens trying to meet the healthcare needs with their lifetime savings, all these set of people face their own challenges resulting in stress. 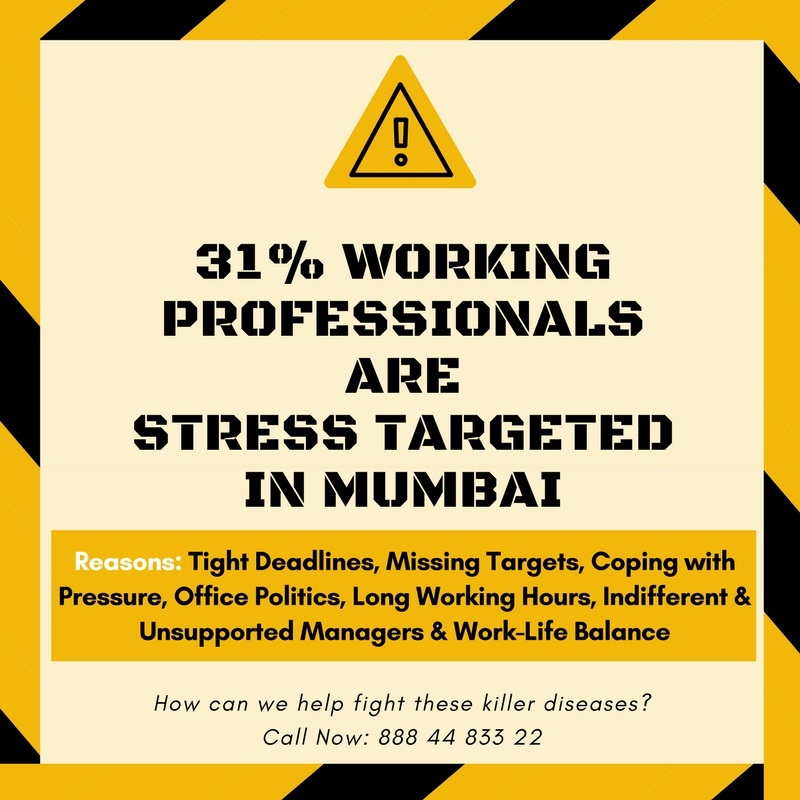 The study, conducted by Lybrate, an online doctor consultation platform, revealed that nearly 60% of working professionals suffer from stress in Tier I cities and in Mumbai 31% working professionals are stress targeted in Mumbai. When examined, the reasons that came forward were tight deadlines, missing targets, coping with pressure, office politics, long working hours, indifferent and unsupportive managers and work-life balance. Studies have shown that constant stress, or `cumulative trauma disorder’, can lead to chronic ill-health. A nephrologist from KEM Hospital in Parel said, “Indians are already at a higher risk of developing kidney diseases because of the surge in the number of patients suffering from diabetes and high blood pressure,” and with this diseases of the kidney and liver too have shown a sharp increase leading to deaths due to kidney failures. With the lifestyle changes, the shift in the drinking habits of men and women in the city is majorly attributed to the rise in the lifestyle diseases like chronic liver disease and cirrhosis deaths. In Mumbai, common diseases in humans are bacterial diseases, rheumatic heart disease, congenital heart disease, coronary heart disease, skin diseases, liver disease, nervous system diseases. For the fact, all these diseases are preventable to a great extent. But ”how?” is the question. How can Master health check-up help fight these killer diseases? The best way to detect diseases early and take the necessary steps to prevent them is to get a regular whole body master check-up done, popularly known as annual health check-ups. Master health check-up is a thorough full body check-up to know the condition and the functionality of the vital organs that keep our bodies in running condition. It is easy to find the health status, detect diseases early and manage the treatment procedure and costs. At Bookmyscans, we offer many packages that help you find the status of your health easily at affordable prices. We have packages that suit all of all ages and also customized packages to analyze Heart health, bone health, brain health and much more separately for men and women. We assure you will not end up wasting money on unnecessary tests. Our general package offers you 87 tests that calculate your vitals, 28 complete hemogram tests, 11 liver functionality tests, analyzes 9 toxic elements in your body, diagnosis 8 lipid profile elements and 6 cardiac risk markers, 5 kidney and renal functions, detects 4 iron deficiencies, checks 3 thyroid and vitamin profiles, 2 arthritis, pancreatic, electrolytes and diabetes tests each and checks for the male and female hormone levels. Along with this ECG, Chest X-Ray, TMT, USG Abdomen, PFT are the imaging and physical examination tests we offer, and all at a golden price with a considerable discount. 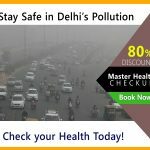 Other aspects of a Master health check-up that could help a common man? Master health check-ups have immense benefits. Apples look really appealing and tasty with the red color they carry, but sometimes these same appealing and tasty looking apples may be rotten from within. Similarly, what looks healthy from outside may not always be healthy from inside. In the busy lifestyle a common man leads, many times we tend to overlook some symptoms and most of the times people may even not be aware that few small sicknesses may be alarming symptoms of few deadly diseases. The awareness about master health check-ups needs to be spread all over so that more and more people may understand the importance of this full body check-up and how this small step was taken can save a lot on the treatment costs. Heart diseases, Cancer, and diabetes are diseases that are known to be genetic, heredity and people with a family history of these diseases are at a higher risk. Heart diseases and diabetes can be detected early with few simple blood tests and diseases like Cancer needs to be detected as early as possible for a cure. We should understand by now that early detection leads to early diagnosis and early diagnosis means early cure and recovery. Early detection of diseases makes sure that you get treated better and at a lower cost. There are many families in Mumbai which depend on a single salary of one working man, and if this man is not healthy the condition of the family is beyond imagination. These days, many master health check-ups come under the coverage of “diagnosis and treatment costs” provided by insurance companies. Besides this, you can also avail a tax exemption from income tax under 80D. Keeping monetary benefits aside, a healthy life is not just important for you, but also for the people who depend on you. Is a preventive health checkup necessary for a 26 to 28 year-old man? Mumbai is populated with people of all the ages. It accounts almost 1% of entire country’s population and the population of Mumbai is growing faster than any other city in India. The city, popularly known as the financial and entertainment capital of India has the maximum working population. The youngsters aged between 26 and 35, the working population is the one which needs the master check-up the most. As mentioned above, 31% of the working population of Mumbai is stress affected and is at a higher risk of chronic illnesses. Stress is something people are not too comfortable talking about. But it is very important to vent out frustration or stifling emotions in a healthy way. “Unattended stressful feelings or emotions can lead to major health problems in the long run,” said the Founder & CEO, Lybrate, Mr. Saurabh Arora. Stress can impact health in many ways from early aging, weight gain to heart problems. Also, this is the age group that leads a sedentary lifestyle. All this shows that they are at a higher risk of being affected by the chronic diseases and will need regular full body check-up annually. A healthy life will help them build a healthy career as well. Only a healthy body is active and can cope up with the fast pace of life in Mumbai. What can we offer you at Bookmyscans? Mumbai is home to more than almost 21.3 million (2016) people. The present healthcare infrastructure of Mumbai was planned between 1950 and 1980 and it catered the needs of 5 to7 million people. But the demand for healthcare and diagnostic needs has increased out of proportion with the shift in the diseases pattern and burden. The same infrastructure is being used by more than 18 million people today. With such a gap in the demand and supply of healthcare facilities needs, it is very difficult for the doctors to treat people as well as it is inconvenient for people to find the best place to get their healthcare needs met. This is why exactly Bookmyscans.com comes to your help. Bookmyscans is one-stop online guide which provides information about the best diagnostic centers near you. The actual cost for a Master whole body health check-up in Mumbai is above INR 10,000. We, at Bookmyscans.com, offer you a package of 87 tests starting just at INR 4,999! We offer packages that suit all but yet customized for men and women separately. We currently have packages like Master Health Check-up GOLD (Men @ INR 4,999 and Women @ INR 5,999) and Master Health Check-up PLATINUM (men @ INR 5,999 and Women @ INR 6,999) for men and women separately. The package comprises of 87 different tests that analyze your body for the present condition and diagnose any risk factors that may lead to chronic diseases. Master Health check-up cannot be taken in any diagnostic center nearby, but you need to find a reliable one. Bookmyscans partners only with centers that are approved and certified by AERB, ISO, and NABL. The partners are audited periodically and regularly to make sure they provide quality services and produce accurate results to avoid further unnecessary tests. We help you find the best diagnostic centers in Bhayander, Kalyan, Andheri East, Kurla, Borivali, and Prabhadevi in Mumbai. We have served more than 10,000 people and helped people realize that investing in Health Check-Up Packages today is a smart way to save on the major treatment and surgeries that might be required if a disease is left undiagnosed.